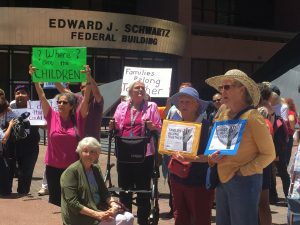 The partial government shutdown is causing delays in the family reunification case being heard in a San Diego federal court. Judge Dana Sabraw, who is hearing the class-action suit brought on behalf of immigrant families separated at the border, has granted a request by the Trump Administration to pause deadlines related to the lawsuit originally filed in early 2018. The suit, brought by American Civil Liberties Union (ACLU) attorneys, called for the reunification of minors separated from their parents as a result in great part of the “zero-tolerance” policy implemented against illegal immigrants. As of the most recent report, submitted in mid-December, the government had 10 minors in custody who were about to be reunited with their parents. However, the Office of Refugee Resettlement (ORR) had an additional 151 children under their care who would not be reunited with their parents for a variety of reasons. In the case of 84 of these children, their parents had been deported from the U.S. and had notified the government that they were waiving their right to reunification so that their children could remain in the U.S. and be released to a relative or guardian. The parents of 11 other children did the same, although these parents still remain in the country, according to the report. It was also determined by Homeland Security (DHS) officers that 28 of the children had not in fact been separated from their parents, and the parents of 28 more were found to be a danger to the children’s well-being, mostly as a result of having a criminal background. The Trump Administration was supposed to update the court as to the progress in the reunification process mid-January, but due to the government shutdown the attorneys assigned to the case are prohibited from working. As a result, the Judge granted a pause in the process, with the condition that the Department of Justice (DOJ) legal team notify the court as soon as Congress reinstates funding. The U.S. has started 2019 with 25 percent of federal employees furloughed after President Trump made good on his threat to shutdown the government unless he got $5 billion dollars in funding to build a wall between the U.S. and Mexico, a request that Democrats denied. The family reunification case, made up of three class-action lawsuits, reached an agreement last November, when the Trump Administration agreed to reconsider the asylum petitions of families that had been impacted by the separation policy. Since then, Judge Sabraw has been closely monitoring progress, and the government was supposed to submit progress reports every two weeks. The latest report indicated that 298 persons, 109 of them minors, had received documents – in most cases with a response to their petition, although the details were not included in the report. One of the conditions being asked for by the attorneys representing these families is to establish a plan that guarantees that no more parents will be separated from their children without a path to reunification.